Conservative Leader Stephen Harper is proposing to offer families with children under 18 a tax cut when the economy rebounds. Harper honed his attack on Liberal Leader Michael Ignatieff as pursuing an agenda of high taxes by contrasting his plan to lower taxes on families. The proposed policy would allow families, with children under 18, to split their household income of up to $50,000, once the federal budget was balanced. The Tories estimate that almost 1.8 million families would be able to capitalize on the tax package and they would save an average of $1,300 annually. Michael Ignatieff criticized Harper's planned family tax cut during a campaign stop in Toronto on Monday. ((Ryan Remiorz/Canadian Press))"The tax system does not recognize the fact that many, even most families, pool their income to pay their household bills. Nor does it recognize that families share together the special expenses of raising their children and planning for the future," Harper told a news conference. "Instead it treats families the same as roommates living under the same roof with no financial attachment. That is not realistic. That is not fair. " Before the policy is implemented, the Tories must first balance the budget, which is expected to occur in 2015-16. "We think that once the budget is balanced, fixing this should be one of our highest priorities," Harper said. 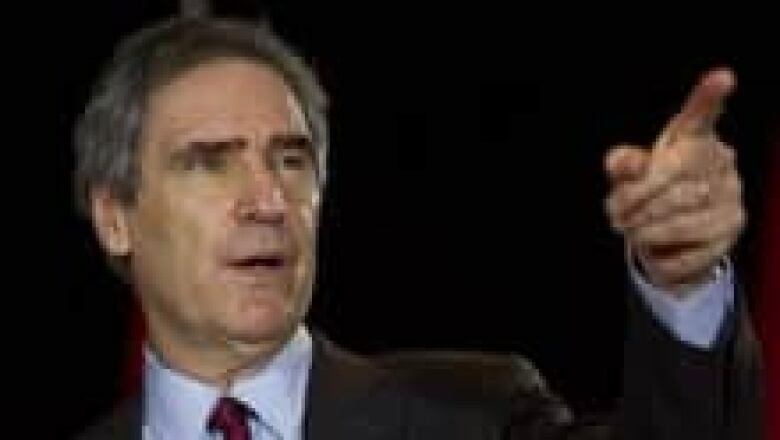 Ignatieff seized on the delay in the Tory proposal during a campaign stop in Toronto on Monday. "The interesting thing about his proposal is it is going to take effect in five years," Ignatieff said. "So it is like he is saying to middle-class families, 'Take a number, and come back in five years and we'll see what we can do for you." Ignatieff said the money to cover the measure isn't available right now because the Conservatives are offering it to insurance companies and oil companies instead. New Democratic Party Leader Jack Layton also criticized the tax plan for putting off needed financial help for Canadian families. "Bottom line is, why doesn't he take some action now to help families," Layton said. "Instead of promising Canadians that years from now, if they happen to have any kids left by the time he gets around to it under the age of 18, they might get some help." Bloc Québécois Leader Gilles Duceppe told reporters at a news conference in Montreal that the proposal sounded very much like a budget item. Duceppe said he wondered why the family tax cut plan was not contained in last week's federal budget. "It's kind of strange that last two weeks there was a budget [that] didn't say a word about that," Duceppe said. "For a man who said he didn't want an election, it's kind of a surprising announcing that this morning." But Harper defended how he is handling the announcement for future income-splitting for families. The Conservative leader said he's made it clear that he wants to see the deficit erased without raising taxes. But once the budget is balanced, Harper said he wants to let Canadians know about the next phases of the government's agenda. The Conservative government has already implemented a policy of pension income splitting for seniors. Income splitting allows families to reduce their tax burden by pooling their incomes together. A higher income earner can shift income to the lower earner, resulting in lower overall taxes. Currently, a parent earning $60,000 and another earning $20,000 pay roughly $1,300 more in federal income taxes than if the two individuals each made $40,000. Vote Compass: Whose views are most like yours?